How Much Electricity Can We Generate? The PV tiles can generate up to a maximum of 1.92 kW. The actual output depends on the amount of sunshine and daylight hours in any given period. At 10.50 am on 30th March 2007 our solar roof was connected and started generating immediately. 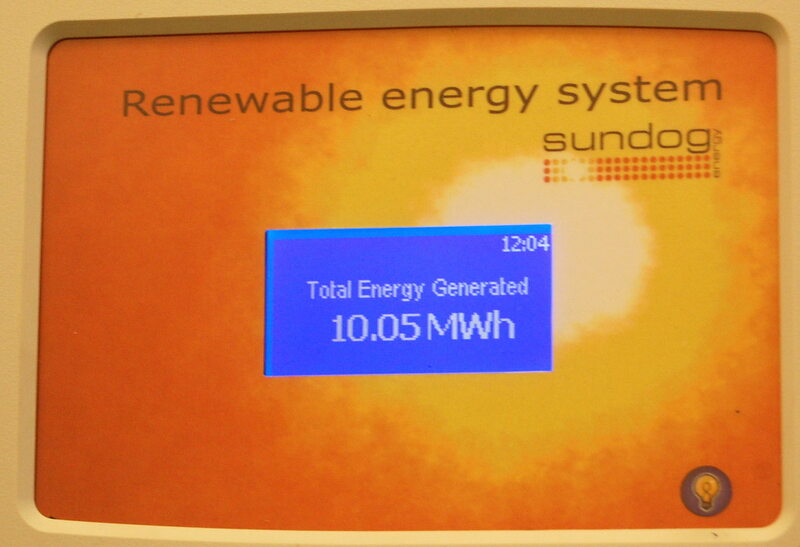 In the first year to 31st March 2008 we generated 1,347 kWh (units), around 60% of our annual electricity consumption. Our solar panels have continued to perform well to the present time, generating between 1,250 and 1,350 kWh (units)per annum, most of which has been exported to the local network. We passed a significant milestone on 3rd August 2014 when the total generated exceeded 10 megawatt hours (10,000 units), enough to supply a typical household for 4 to 5 years. Look at the meter below to check the grand total of units produced to date. Regrettably, our plans to install additional generating capacity in the form of a domestic wind turbine were halted for the time being by the demise of the manufacturer, Windsave.